Uma aventura diferente nas estrelas. Chega amanhã à eShop da Wii U.
Chegarão às lojas a 30 de Setembro. Versão em alta definição da versão 3DS. It’s a game about space adventure and survival, where you recruit this team of rag-tag robots and explore what’s left of a destroyed earth. The idea of the core gameplay is that you board enemy ships and command this crew in a unique variety of turn-based combat — but obviously it’s not only about this combat, it’s like Dig, it’s going to be story driven. There’s going to be a start, there are going to be characters with quite a bit more depth hopefully than we got to with the characters of Dig, and there’s going to be an end to the game. So in those respects they are similar, but otherwise the gameplay, as you have seen, is really quite different. Where Dig was a Metroidvania digging platform adventure, Heist is a turn-based combat game set in space featuring steam driven robots. So they’re very, very far apart in terms of gameplay. Vou comprar a versão U.
Oh boy este promete e muito! So our new release window is “2015”. And it won’t be before fall this year. If you’re disappointed I do feel with you. But even worse would be you purchasing an incomplete game, right? We’d never let you experience that. 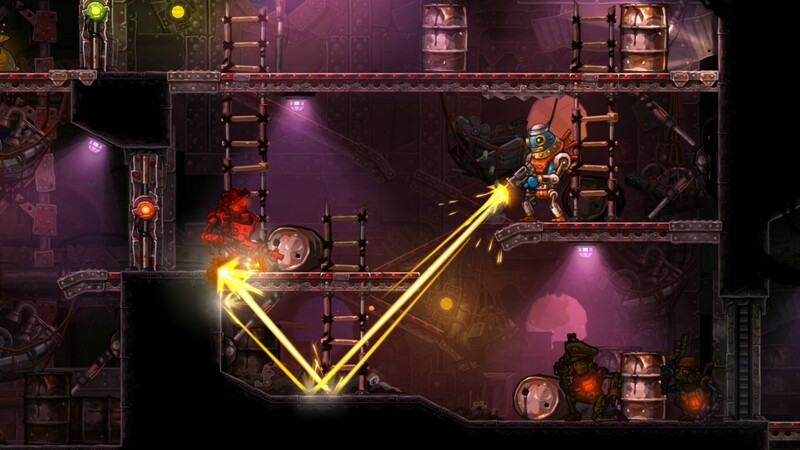 And like I said above: With the extra time we will make SteamWorld Heist the best turn-based, skill-based strategy game with steampunk robots. In space. Nada o meu estilo de jogo. Pena, dado que gostei tanto do Dig. Eu gostei e acho que tem potencial mas também tem tudo para ser demasiado repetitivo. O Steamworld Dig também tinha tudo para ser repetitivo e eu achei bem diversificado. Era por o jogo ser curto se tivesse mais conteúdo ficava aborrecido, se bem que terminei o jogo na VIta e já vou a meio na versão da WiiU. este parece um codename steam em 2d, eu gostei. Sinceramente não me chamou muito a atenção até agora.